Maybe unemployed and crashing with friends in the city where you went to University isn’t exactly the place you plan on being half a year after the big day at Senate House. It’s hard to say. Like many of the people I met here, I had been excited to finish with the Sisyphean supervision cycle so that I’d finally be able to crack on with writing that novel. We’d make big bucks as authors and never have to make awkward small talk by another office water cooler. A couple of years and a couple of trees’ worth of essays down the line, most of us were ready to settle for just a couple of evenings off per week without work guilt. Plans change. You should prepare yourself for the worst after Uni. Or rather, in less scare-mongering terms, you should be ready for things not to go to plan. Up to now, your life has been divisible into deterministic chunks. One school led to another school, and so on, until University. Picking which University is a nice first stab at exercising control over the course of the rest of your life. But you’re almost done with that. I like to think of life before graduation as a bit like following Google Maps to get to the beach. Everything on the other side of graduation is that big blue sea stretching all the way to the horizon. Treasure, sharks, foreign lands. A dash of thalassophobia. So, of course you should prepare for the worst. In your current form, you’re likely to be horrendously ill-equipped to make a good call as to what the entirety of the rest of your life should look like. Be ready to swim back to shore, dry yourself off, start again, and know that you were dignified every step of the way. Even when you fell in the water. Your ‘area’ is the hand-wavy patch of professional space which you can tell your relatives that you’re ‘going into’ after Uni. Everyone has an area. Mine was finance. I was drinking with a friend’s dad the night before graduation, working prodigiously on the hangover of a lifetime. When we reached our Nth beverage, talk turned to my area and the progress I was making finding a future within it. He later helped me to refine my CV, identify companies to apply to, and even acted as my referee to a mid-size accountancy firm. They offered me a six-month internship, or as I liked to think of it: a Golden Ticket to Willy Wonka’s Moolah Factory. Now, there’s a certain low-level Zeitgeist in Cambridge purporting that a 2.2 grade or below is not a significant achievement attained at one of the world’s most rigorous and challenging academic institutions, so much as it’s a reminder not to ask its recipient what grade they got. I needed the win of getting that job because I worked harder than ever on exam revision for my final year and got a 2.2. Shock horror. I may have done pretty well in most things, but my average was still below the level where people don’t feel the need to point out that they did pretty well in most things. Let’s address that Zeitgeist. 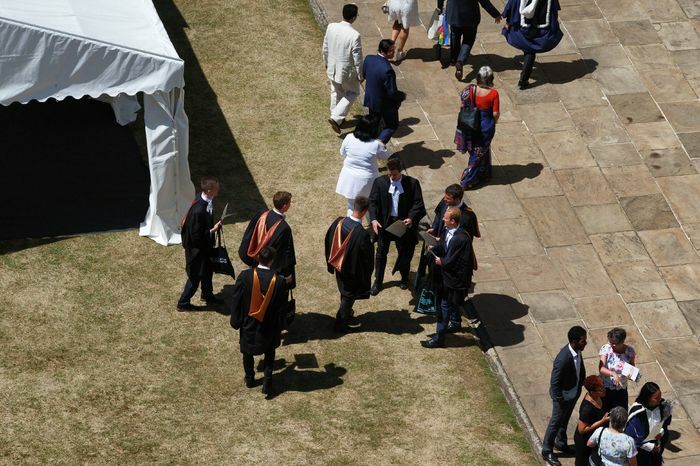 It’s not true that employers don’t care what grade you got because you went to Cambridge. It’s also not true that a 2.2 from Cambridge is the same as a first elsewhere. You didn’t study at another University. You do not know. But let’s take your achievements on their merits. Keeping your head straight whilst studying at this University will be among the hardest things that many of you ever do, and to get here you had to have a certain amount of luck and a certain amount of ability which means that by a certain metric, you’re pretty good at stuff. It is not true that some sub-par grades invalidate everything else you achieved here. Cambridge is hard. Prepare for the worst. Plans change. I quit that accounting job after seven weeks. When clockwatching goes from a coping mechanism to a survival mechanism, you need to re-evaluate. Unemployment was rough, but I was able to stay with friends in Cambridge while I job-hunted. I considered starting a business. We’re a tech-savvy age, after all. You can monetise your hobbies or start a digital marketing agency for vapes. I even had the work ethic and faux-hipster wardrobe. But start-ups are for people with pre-existing capital, not folk like me who adhere to their pledge to pack up smoking by being too poor to smoke. Willy Wonka’s Moolah Factory was closed for renovations. One day, after I moved back to Cambridge, I walked around the back lawn of college, along a path where many important things had happened. It was a walk around a garden which didn’t belong to me anymore. Just a nice garden. That was okay. Even at the lowest point, I was a shade of okay. Sure, there was the debilitating sense that everything which had arisen out of my lifetime of luck and ability was turning to ash and burying me. But failing is a verb, a doing word. You do it for a little bit, and then, hopefully, you stop. When you fall out of your boat and into the water, the first thing to remember is not to panic. It wastes energy, it attracts sharks. Slowly and calmly, swim on your back to the boat. And if the boat looks out of reach, swim back to the beach. Lay down for a while and catch your breath. Be happy to have escaped. The experience alone means that you did not escape with nothing.